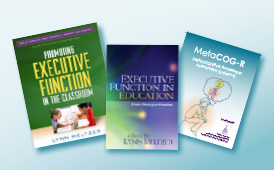 A comprehensive curriculum spanning nine months and teaching students critical executive function strategies that promote academic success. To see how SMARTS maps onto the Common Core Curriculum Standards, click here. WELCOME This unit is designed to teach students the importance of metacognition, provide background knowledge of the core executive function processes, and help them to apply their knowledge of executive function processes to better understand themselves as learners. Unit 1 provides a foundation for teaching the Executive Function curriculum. Each lesson builds students’ understanding of EF strategies and links these strategies to the academic demands of middle school, high school, and college. IMPORTANT: Be sure to watch the Overview Instructional Videos. 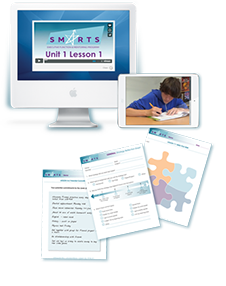 These videos are not just the overview for Unit 1 but an essential foundation for teaching the entire SMARTS curriculum. It is important to take the time to watch these videos before teaching the SMARTS lessons so you have a good understanding of the SMARTS educational system. Unit 1 Overview - “Why Do Students Struggle with Executive Function?" When you have completed this form, you will be returned to the EF curriculum page, with access to the free lesson (Unit 4A Lesson 2) and all its content, including handouts, video, and more, everything you need to experience the power of SMARTS EF Curriculum in your classroom. Why are you interested in executive function? Your response may be used anonymously for program evaluation or marketing purposes. Click on the blue buttons below to access each lesson. Students engage in a discussion about “metacognition” and identify their personal strengths and challenges. Students begin their own strategy notebooks that they will use for the duration of the SMARTS program to record reflections and collect handouts. Students discuss the concept of cognitive flexibility and its importance for strategy use. They complete an activity that illustrates how words can have multiple meanings. Students complete an activity that introduces them to the five executive function processes and helps them to identify their strengths and challenges in these areas. I-SEE a strategy: what makes a strategy a strategy? Using case studies, students identify which strategies are individualized, systematic, efficient, and effective (I-SEE). Then, they examine their own strategies, refining them to ensure they fit the I-SEE model. Students learn to create personalized and achievable goals that are Clear, Appropriate, Numerical, Doable, and with Obstacles considered (CANDO). Students review common obstacles that prevent them from achieving their goals. Building off of Lesson 2.1, students take the goals they have already set and develop strategies to achieve these goals (e.g., students break goals into steps and think about the obstacles they may face when trying to achieve their goals). Students explore shifting between multiple perspectives in writing at both the sentence and paragraph levels. Students consider the importance of a flexible approach to writing that addresses multiple audiences and rewrite a paragraph from a different perspective. Students learn how to comprehend what they read efficiently and how to differentiate between the main ideas and details of a text. Students use highlighting to identify multiple perspectives when reading and taking notes. This strategy also helps students highlight effectively and to avoid over-highlighting (the “yellow page syndrome”). Students identify multiple methods for solving a problem and understand how the same problem can be analyzed in multiple ways. Students learn the 4 C’s strategy for organizing and then apply the strategy to the organization of their own belongings. Students examine their understanding of time and their time estimation abilities. Students learn to prioritize events within a metacognitive framework. They then differentiate between mandatory tasks (“have-to’s”) and optional tasks (“want-to’s”) and learn that time can be flexible. Students practice breaking down long-term assignments into manageable steps and using calendars to plan for these long-term assignments. Students practice using weekly schedules and daily timeframes for short-term planning. Students learn strategies for organizing information to improve their reading comprehension and writing. They also learn how to focus on “big ideas” or important concepts in relation to the details. Students shift from organizing ideas using a detail-oriented, bottom-up approach to using a big-picture, top-down approach. Students learn strategies to help them identify, record, and organize critical information from a class lesson. Students learn “Triple-Note-Tote,” a three-column strategy for note-taking, which can be used across the content areas. Students learn to prioritize information for studying and to create a “Triple-Note-Tote” study guide. Apply memory strategies to important information across the content areas. Each student learns about his/her own memory system and how this works. Activities focus on the basic types of memory (short-term memory, long- term memory, and working memory) as well as exercises for accessing working memory. Students are introduced to two memory aids that help support working memory, using their pre-existing knowledge to make verbal and visual connections. Students learn two strategies that require them to use working memory to build stories and phrases in order to lock information into long-term memory. Students combine the memory strategies they learned in previous sessions to create study tools to help them review for tests. Students learn the definition of self-monitoring and practice monitoring their behavior to ensure that they stay on task and reach their goals. Students learn the definition of self-checking and participate in activities to help them understand when and how to use self-checking strategies. Students use previously graded assignments to check for their most common errors. Students generate a list of their personal Top-3-Hits for checking their own future assignments. Students learn to develop checklists for self-checking from the directions of an assignment. Students review the SMARTS Online strategies they have learned and create a checklist of strategies they can use for their schoolwork.